Whether fresh from the sea in the early season or holding fish in low water late season, the Atlantic Salmon of the Gaula are some of the meanest you will encounter, and aggressive to the fly. 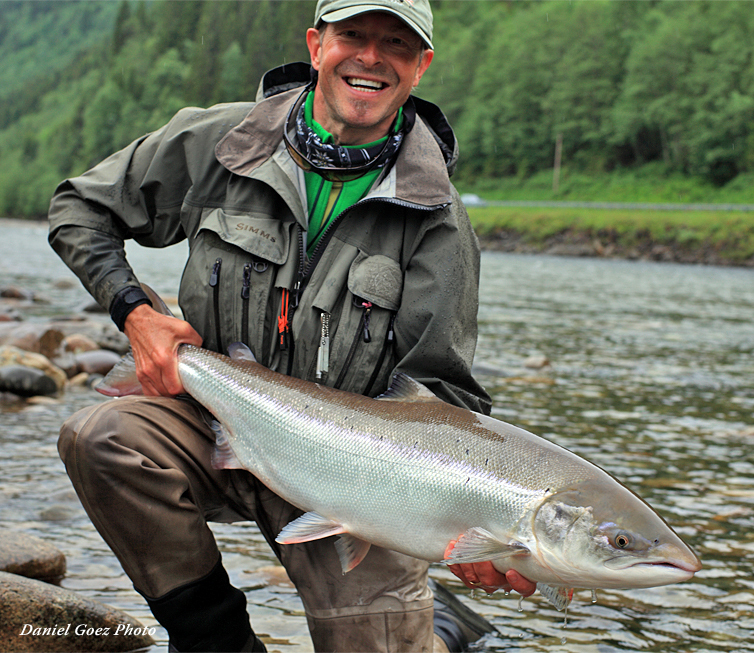 The Gaula River is an amazing fishery, a rather fast flowing river which runs through unspoiled surroundings starting from the mountains near the Swedish border and running down to where it enters the sea at the Trondheim Fjord. Undammed and extremely wadeable, it is one of the premiere rivers in the country for fly anglers that prefer to cast from the water and that do not care to fish from the boat. The Gaula is one of the most fabled salmon rivers in Norway and it has always been regarded as one of the finest and most productive salmon rivers in the entire world, producing some of the largest Atlantic Salmon taken on the fly. 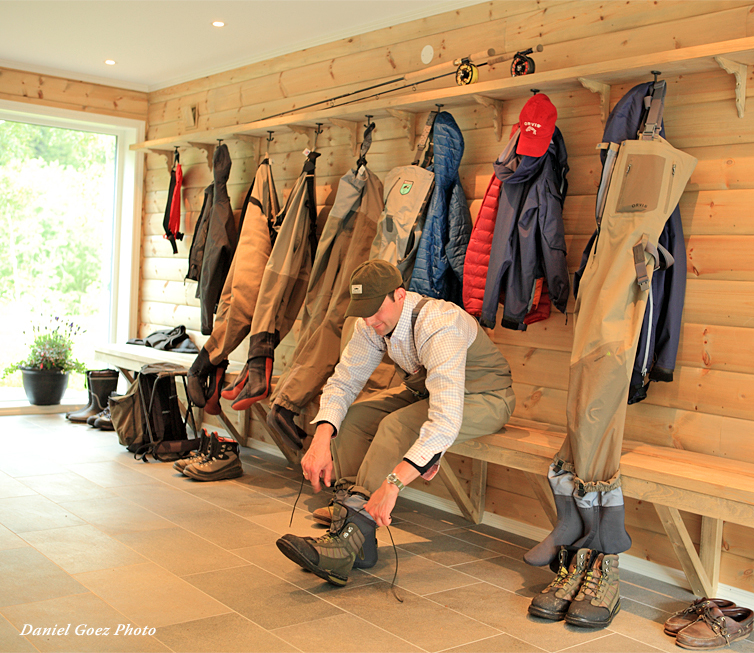 The Norwegian Flyfishers Club has many of the finest beats on the river to provide the best angling there is to offer in any conditions, high water or low, and right next to the salt in the lower river or up river where the fish hold later in the season. The entire length of the river is amazingly beautiful, with very diverse water types for swinging flies. The upper part of the Gaula valley is very narrow and the water is shallower with big boulders both on the banks and in the river. On the lower stretches the valley is wider and the big boulders become gravel bars as you get closer to the sea. They have it all at the NFC and the beautifully remodeled lodge sits in the perfect location on the river for access to wherever you need to be. The cost of the week-long Norwegian Flyfishers Club package ranges in price, depending on the particular week. 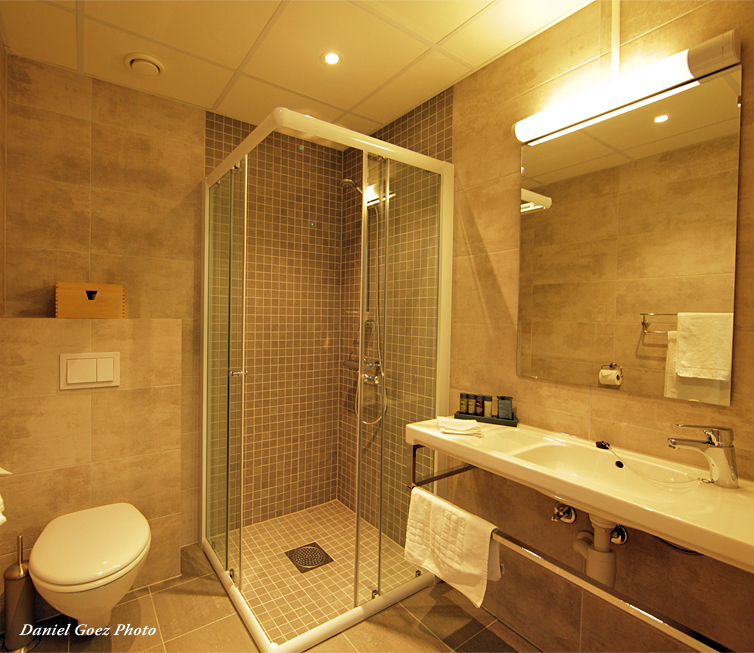 Please call for rates (800-669-3474). 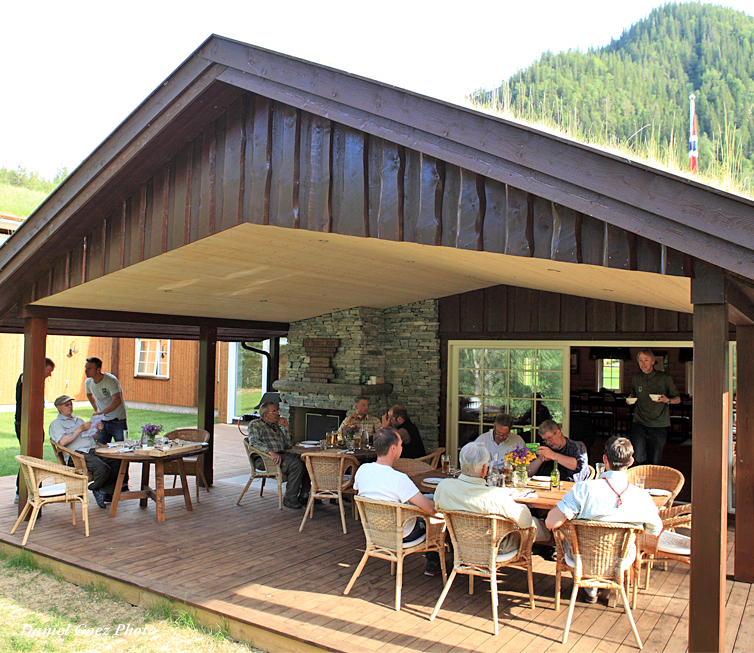 Included in your angling package at Norwegian Flyfishers Club is accommodations and all meals at the lodge, rental car for transfers from Trondheim to the lodge, guided fishing with daily transfers to your beat, and local alcoholic beverages. Not included in your angling package at Norwegian Flyfishers Club are fishing license (approximately $100 USD), transportation between home and Trondheim, imported alcohol, and gratuities. 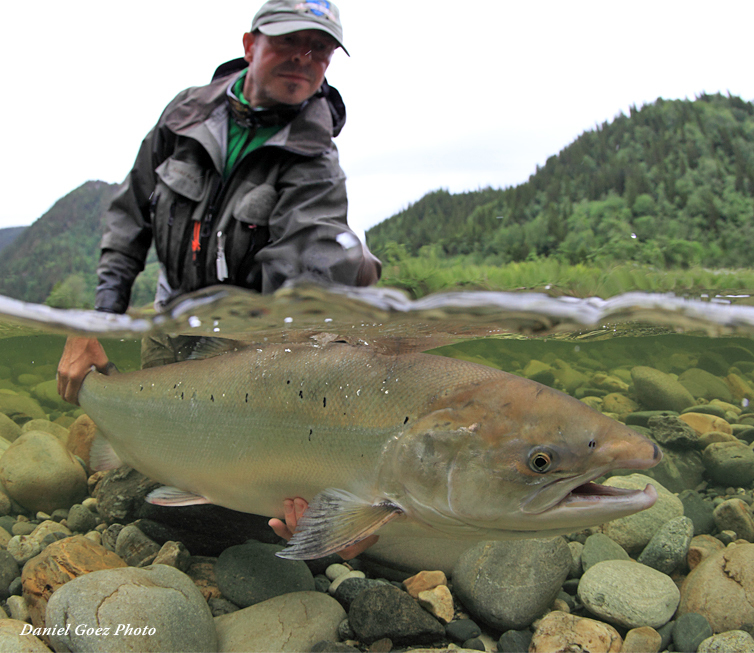 It's in the final days of May through early June when the big, chrome bright, fresh salmon begin to show in the Gaula. They avg. 10 to 15lbs with many fish that will go over 20lbs and a 40lb or bigger salmon is no surprise, however it is a big time catch that does not go unnoticed. Your story about that giant fish will be retold over and over throughout the season. Very few anglers will ever get to see a fish that big. It is one of the most prized things in all sport fishing. Those giant salmon are out there. 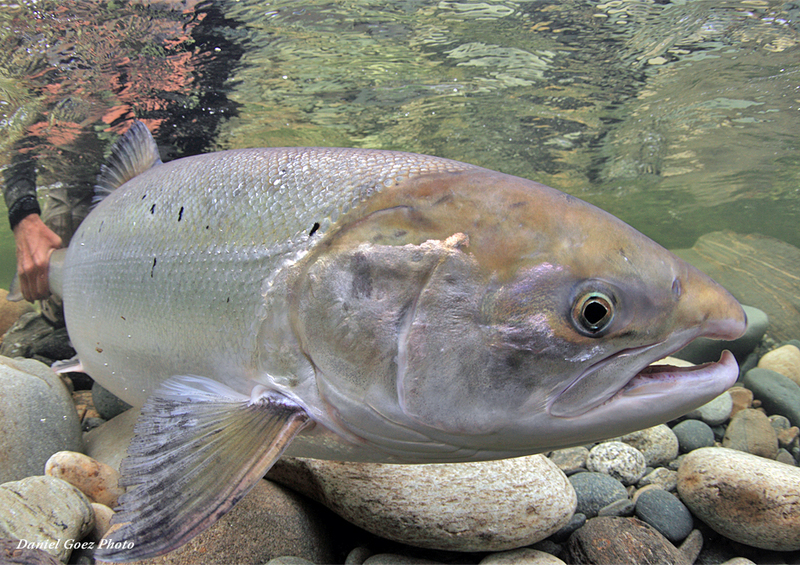 By mid June through mid July, the bulk of the Atlantic Salmon run is in the system and the fish are spread throughout. As the season winds on, the wading is easier due to the decreasing volume of water. Some anglers believe this is the time of year for perfect wading conditions and numbers of salmon. 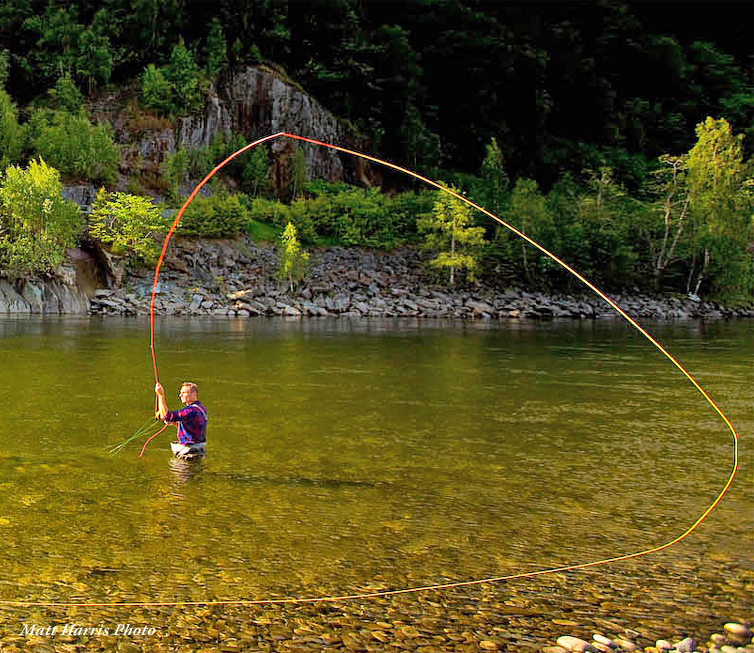 Without a doubt, anglers will find Atlantic Salmon holding in all of the Gaula's beats. As the water level continues to drop through the end of July and into early August, the fishing can get excellent on the floating line. Bigger fish are always in the mix and there's always a story at the end of the day backed up with photos. Great fishing extends through August before the river closes to angling, but there can be some amazing fishing during the last days of the season. 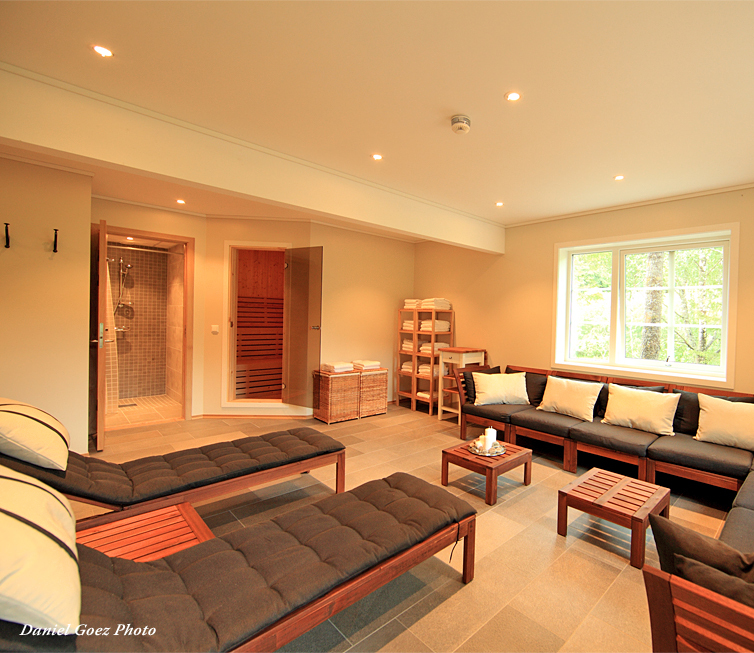 Everyone will make their own arrangements to arrive in Trondheim, Norway, the closest major airport to the lodge. Stopovers anywhere else in Europe can be easily arranged. A rental car is necessary to transfer from the Trondheim airport to the NFC. 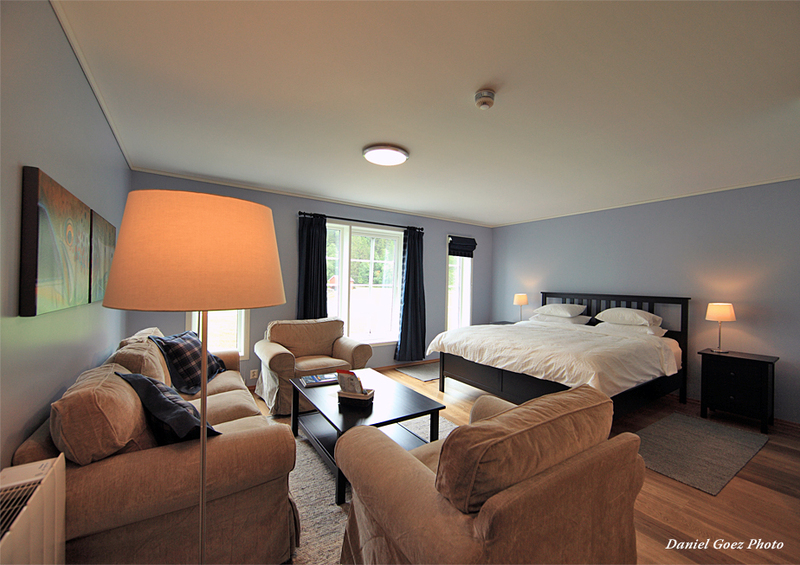 The lodge will make the arrangements for you to pick up the car at the at Trondheim airport and then you will drive yourself the easy 1 hour 20 minutes to the lodge, just outside of Storen. kitchen is connected to the main dining facility, which is part of the main lodge room. This large common room also houses the bar and lounge area, with a fireplace and couches for relaxing between long fishing sessions. The lodge also has a stocked fly shop to supplement your gear or replace something if you happen to forget it. 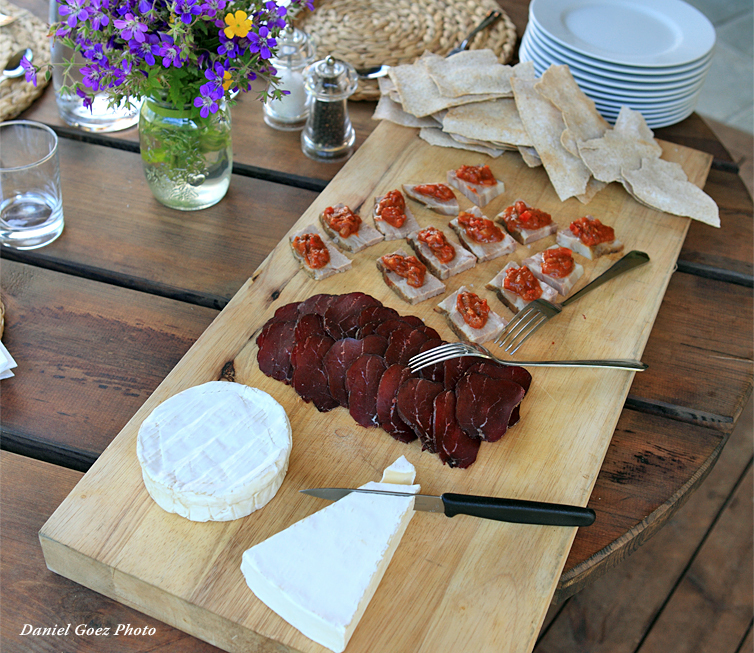 Breakfast, lunch and dinner are offered at the lodge, but are also available as a river-picnic, if your assigned beat is just too good to pass up. Meals can either be picked up at the lodge, or shuttled to you riverside. All that, plus the 2 home pools in back of the lodge are amazing to take one last pass for the day before heading off to bed. The excitement felt every time the line goes tight is unreal. It could be that monster 40+ pound fish. 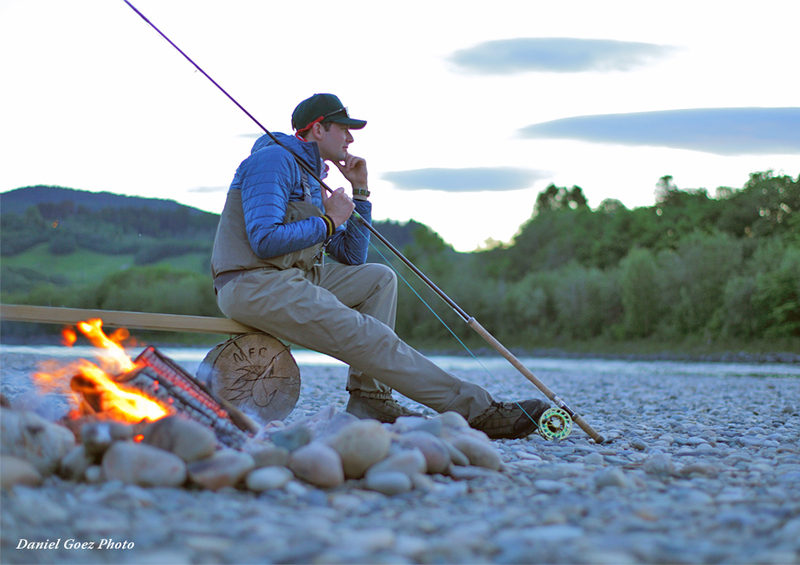 has acquired are some of the best in the river, providing the fly caster, whether two-handed spey or single handed, the opportunity to keep the fly swinging through prime lies all week. 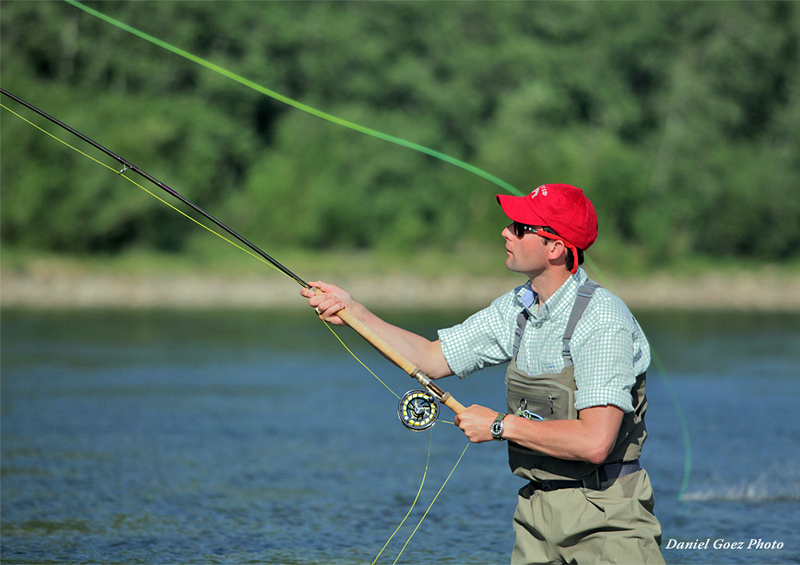 Following the Gaula River regulations, NFC operates a 24-hour a day fishing rotation. This rotation is broken down into 6-hour sessions per beat and two fishermen fish each beat at a time. The Gaula is one of the last rivers which have not been dammed for hydroelectric power- something which only adds to its natural beauty and the excitement of the fishing. This means the water level is invariably changing and conditions are constantly in flux. To accommodate for these regularly changing conditions, the NFC rotation has beats which fish well in all conditions. Whether it be high, medium or low water; below the Gaulfoss (which ensure good fishing in the early season), or above the Gaulfoss and in the tributaries. No matter what the present circumstances may be, each fisherman has equal opportunity to fish prime beats during those specific conditions within that 24-hour period. We recommend consulting with NFC staff or guides upon your arrival to maximize your fishing week in terms of prioritizing the most productive beats during that week. 18:00 - Arrive back at the lodge. Clean up for dinner and Cocktail hour. 20:00 - Head out for your evening beat, or relax at the lodge. Fishing at the home pool is open as well. 00:00 - Switch to your early morning beat, if you have the energy!